You may be surprised to know that food poisoning often occurs in the home. Our Food and Safety Team can help you stay healthy and safe by offering your family a FREE Home Food Safety Check. 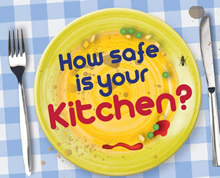 A FREE Home Food Safety Pack to help keep your kitchen safe. Numbers are limited, so request a pack now!